Many wonder about the need for an electric kettle because a stovetop one is just fine or the microwave can do the job as well. While they certainly can, an electric kettle is more energy efficient and faster. Perhaps the biggest advantage is that they shut off automatically so you can turn it on and go do something else without coming back to find all the water gone! An even better alternative is an electric tea kettle with temperature control. Tea and coffee lovers will appreciate being able to have their water at just the right temperature for steeping different teas or even pour over coffee. The best variable temperature electric kettle accurately reaches and possibly even holds the water to the set temperature without too much deviation. That gives you the quickest and most convenient way to brew your tea or coffee at just the right temperature. No need to use a stovetop kettle with a candy thermometer stuck in it! Take a look at some top rated options for an electric kettle with temperature control on Amazon. Coffee is best brewed with the temperature between 192F and 204F or 92 and 97C. White and green tea should be brewed at below boiling point – 170 and 185F. Oolong tea is best between 180 and 190F while black and herbal teas are best brewed between 208 and 212F. Most kettles will deviate between 2° and 5°, which is a small enough range to stay within these ideal bounds. Once the desired temperature is reached, pour it into a teapot that’s holding loose tea leaves or a teabag, or a manual pour over coffee maker. Some connoisseurs insist on having a gooseneck kettle so that they can control the flow and direction of the hot water into the leaves or grounds. If that’s what you’d like to try, we have the best electric gooseneck kettles with and without temperature control. With that in mind, let’s take a look at the top rated electric kettles with variable temperature control. If you prefer to make your tea in a kettle that has an infuser built in, take a look at the top tea making machines. If you’re not too fussed about temperature control and would like to free up a power point by using your gas stove top, take a look at these tea kettles. Another good way to eliminate the use of a kettle is to buy a coffee maker that comes with a hot water dispenser. If you are a tea or French Press coffee enthusiast, the Cuisinart CPK-17 Perfec Temp is an excellent choice for you. Equipped with 1,500 watts of power for quick heating, this unit brings up to 1.7-liters of water to a surging boil in a matter of minutes. You can also choose a more expensive model that can hold up to 7 cups of water. This kettle has six preset temperatures for steeping tea at just the exact temperature based on the variety. It also features a control panel outfitted with blue LED indicators including a “start button” and a “keep warm” button, which can retain the set temperature for up to thirty minutes. Also, the kettle is fitted with a memory feature that allows you to remove it off its base for up to two minutes without it going to standby mode. A removable hard water scales filter is easily washed. The Cuisinart CPK-17 PerfecTemp also features a unique modern design. This includes sleek brushed stainless steel housing, nicely placed controls on the kettles handles, a steel pop-up lid recessed elegantly at the top, and an exclusive stainless steel ring around the rather usual plastic base blends nicely with the décor. Most tea lovers are full of praise for the Cuisinart CPK-17 for its great ergonomics, easy to reach vital functions, high construction quality, and its cordless nature. The kettle costs around $89, which is quite expensive for a kettle. Some customers have also reported problems with jamming lids but all in all, this remains the best electric tea kettle with temperature control. Although considerably smaller than the Cuisinart, the Adagio’s UtiliTEA water kettle boasts lightning-fast heating capabilities coupled with a strong and sturdy design. The Adagio’s UtiliTEA features a stainless steel casing with a plastic handle and a plastic knob-style variable temperature adjustment for different varieties of tea. While its reduced size may bother some serious tea drinkers, it is an excellent choice for personal use than for large families or gatherings. In addition, the kettle’s detachable base rotates 360 degrees, and its pop-up lid makes it is easy to operate one-handed. The Adagio’s UtiliTEA electric tea kettle is relatively inexpensive ($50) and feels sturdier than most other kettles. For safety purposes, the kettle shuts off before boiling dry. Even though it is a huge step from the “boil only” kettles, the Adagio’s UtiliTEA kettle has its faults. One of its biggest disadvantage is its water holding capacity. In addition, the kettles temperature dial is set to tea varieties as opposed to specific temperatures making it hard to pick the best temperature without numerical values on the kettle. You can use a thermometer initially to find the exact preferable settings for each desired temperature range and then stick to the chosen settings. Made with a brushed stainless steel exterior that comes in 3 stylish colors, the Ovente KS88S Electric Kettle sports 1,100 watts of power and a 1.7-liter capacity. At full capacity, the kettle takes around five to six minutes to bring the water to a rolling boil making it among the least powerful kettle in the list. However, there’s a 2 hour “keep warm” function to allow you to use the heated water a bit later. Another additional feature that is so noticeable is the Ovente’s programmable LED lighting, which produces a lovely glowing light that changes colors according to the temperature that you selected. The kettle also has a hidden heating stainless steel element and a removable and washable filter. A flip back lid makes it even easier to clean and fill. For safety reasons, the cordless Ovente consists of features that come standard on all the kettles such as auto-shut off, secure locking lid, comfortable stay-cool handles, and boil-dry protection. Besides being quite inexpensive ($40) and good looking, the Ovente Kettle is a beautiful model that does just what it is expected of it. While it is fair to say that the Ovente kettle is just sufficient for its price, there are a few concerns. These include a rather loud beep every time you change temperature settings and when you return the kettle to its base. Its Keep Warm function only holds the temperature at 185°F and once you return the kettle to its base, you have to reset it to the desired temperature. Tailored with a high-quality glass body to prevent interior staining and designed with precision temperature controls, the 1500W, 1.7L Chefman Precision kettle ensures that each variety of tea steeps at the appropriate temperature and the included tea infuser minimizes the work you have to do to have a good cup of tea. In addition, this kettle can be used as a traditional electric kettle to boil water faster than microwave by removing the stainless steel tea infuser. You can set it between 120° and 212°F and at intervals of 10°. The Chefman electric kettle also features automatic shut-off, a transparent body exterior that allows you to see the contents being boiled, a boil-dry protection, and a 3600 swivel base that allows easy pouring. The added programmable settings and an included tea infuser makes the Chefman electric kettle one of the few value for money kettle models, however, the cylinder holding the tea leaves is sometimes difficult to clean but a bottle brush can do the trick. Designed with a shimmering black plastic housing, this cordless electric travel kettle is a convenient size for your suitcase. With a one-liter capacity (approximately 34 ounces) and 1,750 watts heating element, the T-fal Balanced Living kettle is said to boil a cup of water in less than 90 seconds. A detachable scale filter also comes with this unit, but the most outstanding feature is the 3-position temperature control, which many tea lovers prefer. However, as useful as it is, no precise scale is included. Other features include a cordless 360-degree rotating base that makes it convenient to use it anywhere, and an auto shut-off when selected temperature is reached or when the kettle is lifted off the base. Although T-fal is made with a lot of plastic, it is more robust than some other models, and it can certainly take knocks in a busy family kitchen. The manufacturer also confirmed that the plastic is BPA-free. 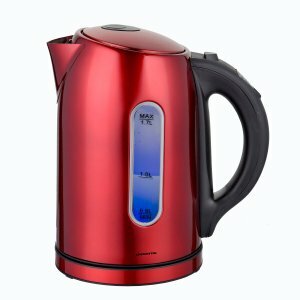 At just one pound, the kettle is a real lightweight and has the most power among all the appliances we have reviewed. In addition, the lids big button makes it easy to open. The temperature selector is also simple to operate an added benefit to people who dislike modern appliance complexities. The kettle is also quite inexpensive with a list price of $49 but can be had for much less. While most customers are relatively content with this product, the most recurring complaint is the occasional failure of the kettle’s selector to work well if the kettle is only half full. Some customers say they can see stuff floating in the water after sometime but this is not plastic or metal peeling off. This is hard water scales which can be gotten rid of if by either using filtered water or by keeping the scale filter in place. Take a look at our other recommendations for electric kettles for hard water. One thing we haven’t taken into consideration on this list is whether these kettles are particularly quiet or not. If you don’t want to disturb people around you while you ready your pot of water, then we have some kettles that don’t whistle and barely make any popping or gurgling noise while the water is boiling. One of them, a Kenwood, also features variable temperature control.